We had a wonderful Christmas this year. We had two gatherings at our house. This is a picture of the cousins on Christmas Eve, but Ashley is missing, she had other plans. But I was thankful we got these 4 together. We had a delicious prime rib dinner. 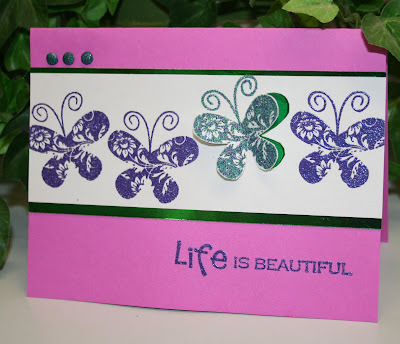 Now on with the stamping:) I made this card with the new stampset Solid Butterfly over at Sparkle N Sprinkle. I embossed 3 of the butterflies with Amythest Spray, and then the 4th one is embossed with Peacock. Then I used a craft knife and cut out the wings of the butterfly and folded them up and layered it on a green mirror cardstock. The sentiment is also embossed with the Amythest Spray, and the brads are embossed with the Peacock. I love the look of the mirror under the wings. Wishing you a belated Merry Christmas! We were with family, too. 8 grandkids from 11 years to 7 months; lots of blessings there! I love the card, especially the idea of mounting the one "different" butterfly on its mirror image. Very nice! Merry Christmas - glad to hear it was everything you hoped for! Adorable card!